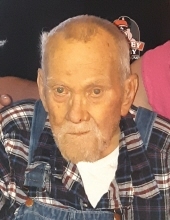 Richard R. “Red” Thompson, longtime resident of Stillwater, passed away peacefully at his home on Friday, April 12, 2019 surrounded by his loving family. Services have been entrusted to the care of Dighton-Marler Funeral Home of Stillwater. Graveside serviced will be 1PM Wednesday, April 17, 2019 at Elm Grove Cemetery in Stillwater. Richard was born April 1, 1935 to Virgil and Alice (Davis) Thompson on the family farm in the Elm Grove Township – Perkins, Oklahoma. He was raised in Stillwater by his grandparents, James and Sylvia (Bickell) Davis. He graduated Stillwater High School in 1953. Right after graduating he joined the U. S. Navy where he served his country during the Korean War from 1953 to 1958 and was then honorably discharged. In 1962 he met and married Florence “Flo” Fritchman in Glencoe, Oklahoma, and from this marriage they were blessed with three children; Kimberly, Shelbey, and Robert. After this union was dissolved he married Clorene (Carr) Graves in Stillwater on March 3, 1971. They shared 40 years together until Clorene’s passing in 2010. He was a carpenter, mobile home mover, truck driver, and then later retired from Mercury Marine after 22 years. Some of Richard’s hobbies/interests include bowling, fishing, and raising a large garden. He spent many hours with his children at Frontier Lanes here in Stillwater where he was known as an avid bowler. He enjoyed spending time working on cars with his boys. The greatest enjoyment of Richard’s life was spending time with his children and grandchildren. They were the love of his life. He made many memories that will be cherished forever. Survivors include his five children; Kimberly Davis and husband David of Jennings, Oklahoma, Shelbey Andrews of Stillwater, Oklahoma, Robert Thompson of Cushing, Oklahoma, John Graves of Stillwater, Oklahoma, Tiffany Birse and husband Thomas of Claremore, Oklahoma; one daughter-in- law, Sue Graves of Perkins, Oklahoma; numerous grandchildren, great-grandchildren, and one great-great-grandchild on the way; several nieces and nephews; and a host of friends. He was preceded in death by his wife Clorene; son, James Graves; his parents; grandparents; one infant sister; sister, Etta Sherman; one uncle, Gerald Davis. The family would like express their love and appreciation to Karman Legacy Hospice for all of their wonderful support and dedication to their dad. To send flowers or a remembrance gift to the family of Richard R. "Red" Thompson, please visit our Tribute Store. Southwest of Stillwater, Oklahoma, on Sangre Road, 1/2 mile between 80th & 92nd. "Email Address" would like to share the life celebration of Richard R. "Red" Thompson. Click on the "link" to go to share a favorite memory or leave a condolence message for the family.